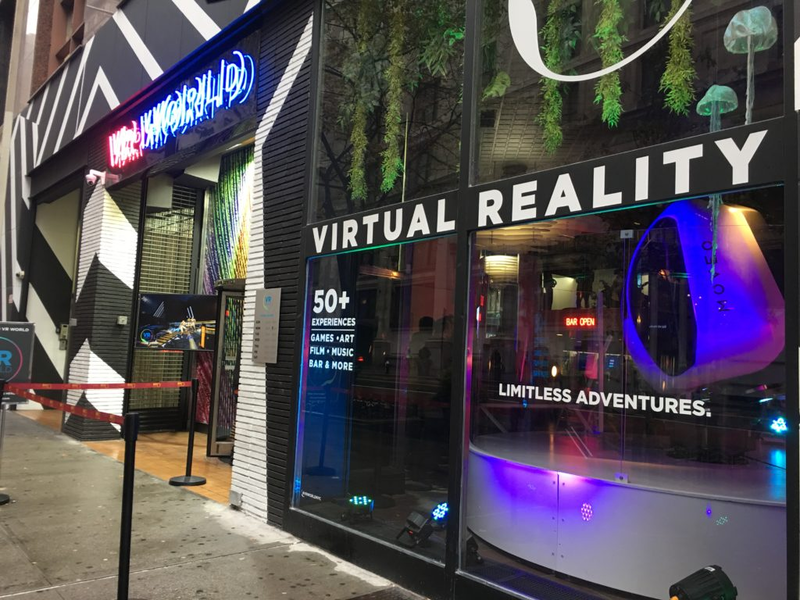 Last year, the largest virtual reality experience center in North America-VR World, landed in New York, right close to the Empire State Building. 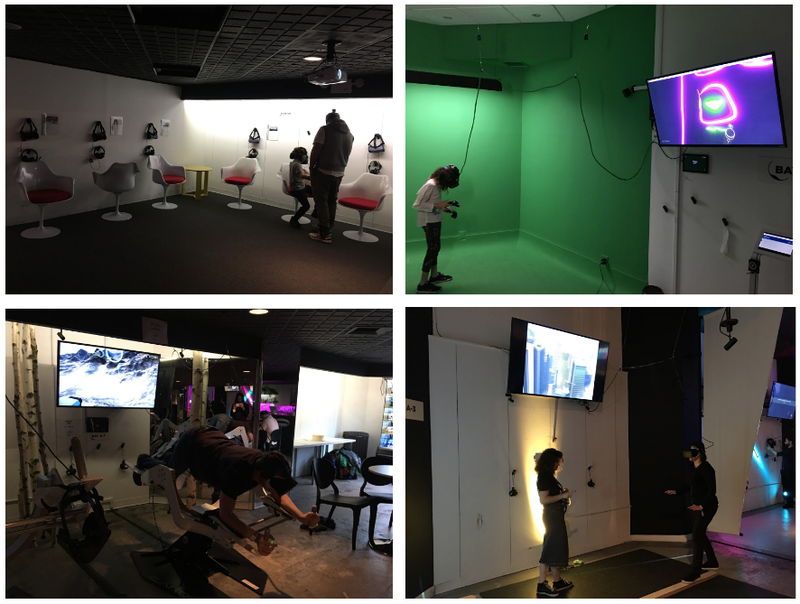 Visitor can try out 50 unique VR experiences in three floors, including gaming, film, art, music, etc. I went there a few months ago, experiencing some games and movies, and also observing players’ behaviors from a user experience standpoint. Visitors are handed disposable eye masks for the purpose of hygiene when using public VR headsets. Each game has guide staff there to assist each experience, ensuring players have a full understanding of the equipment and experiences. Depending on the experience, each should last between 5–10 minutes. Most gaming bays have a big-screen TV where you can watch the action that’s happening in the headset, which makes it convenient to observe players’ behaviors and responses. There are different types of the VR experiences in the VR World, including gaming, film, art, and music, etc. Undoubtedly, gaming is the most popular one and usually needs to wait for playing. All experiences require a headset and headphone. The simplest experiences are you can just sit and watch a film or documentary. The most common ones are those require controllers in hands and your body movements, such as “Raw Data” which lets you shoot droid with controllers, and “Tilt Brush” which lets you paint in virtual reality. Some special experiences normally need other equipment to interact with, such as steering wheel, “paraglider” and “spaceship”. Kids love VR game! During the 3–4 hours I was visiting, nearly half of the visitors are kids and they keep coming back to the game they found interesting. They are very excited and not stopped by the frustrations they came across. I can see a future where a place like this could become a “theme park” like Disneyland and Universal Studios. One interesting thing I noticed is children and adults have different experiences in VR games, majorly because of the height and learning curve. Even though in the same game, we can see the angle of view from kid and adult are different. Adult’s is higher and kid’s is lower because of the height, which actually influences their performance in games. The broader view you can see, the better you can handle the situation, such as the enemy in the game. To improve the experience for kids, designers may consider providing a “child mode” and lifting the angle of view for them. Same for the experiences which require other equipment. In the below example, the kids were struggling with pressing the brake. He cannot sat comfortably when his foot touched the brake. When kids are playing games, they actually consider themselves “an adult/hero” who can beat everything, then why not help them remove the constraints? Having game characters controlled by players is very common in most games, especially in role-playing games. If you play alone, you may not get the chance to see what you look like in the game. While if you have teammates who play with you, then they can see you and potentially collaborate with you. When I was playing the shooting game called “Raw Data” with one friend, even though I am a female, my friend still saw a man in the game which is not very appropriate. It reminds me of a discussion I’ve been through about “feminist theories of technology”, which mentioned how women’s needs are less met by new technologies because there are fewer women worked in the tech industry, either as designers or developers. The situation I came across in the game is just a good example for that. Virtual reality aims to make people feel real, but if women cannot behave or been seen as a female, how can it be real? Another two things I think the UX designer of VR games should consider are the emotional impacts and learning curve. People react differently to the games, some calm and some exciting. Fear and frustration are the two major negative emotions I found when observing other people play. Although negative emotions don’t mean negative impacts, because people could actually be excited about experiencing vivid feeling in the VR games, the emotional impacts are still something needs to be paid attention. VR is emotion amplifier because of the immersion, which can also lead to motion sickness when players lose control — I felt once when I was playing the racing game and suddenly lose the control of the steering wheel. Giving control to players is very important for the user experience of VR game, which connects the second aspect — learning curve. Different people have different learning curves, and different games also have different learning curves. First-time players can act very differently while playing. Currently, every game in the VR World has guide staff there to explain the instructions before each one plays. Therefore, how to make the games intuitive and self-explanatory, and help players master the techniques quickly are good challenges to tackle. When players are comfortable with playing it without assistance, VR games or places like this should be much easier to scale up.